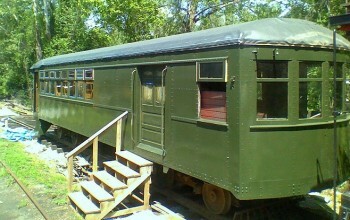 RIDE THE RAILS, WEEKENDS AT CRAGGY MOUNTAIN LINE RAILROAD! 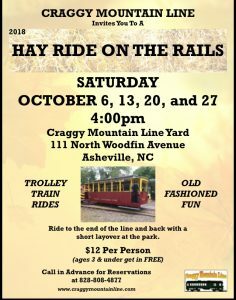 All through October 2018, Craggy Mountain Line is doing rides at 4pm on Saturdays! Come ride the rails with us for a fun afternoon in Woodfin! 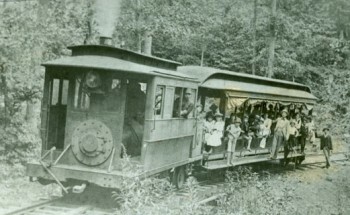 Learn a little bit about the history about the Craggy Mountain Line Railroad and the old Asheville Trolley System, as well as exploring some of the cars we’re restoring, and ride down our track on our newly restored trolleys! October 6th, 13th, 20th, and 27th. Call to book your space now! We’re only doing reservations for our smaller events like this by phone, so please call us at 828-808-4877 to book your spot! For directions to the Craggy Mountain Line click here.